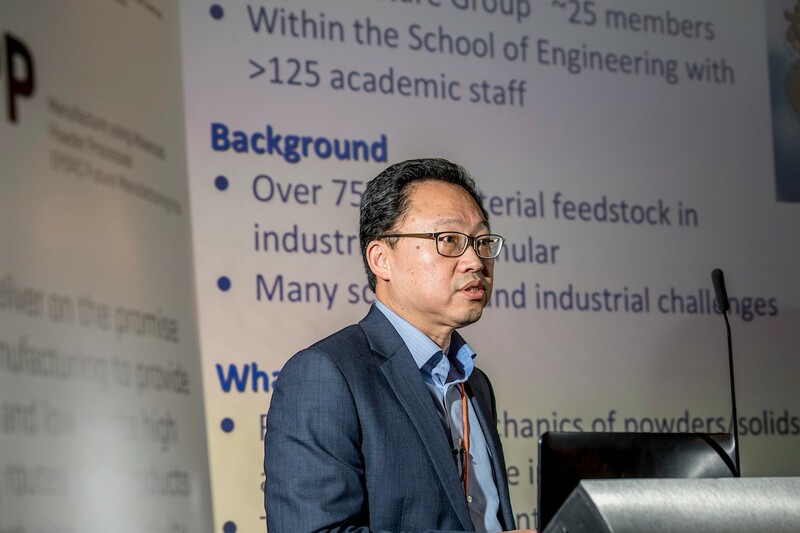 Manufacturing using Advanced Powder Processes is increasing in both quantity and quality, and these are indeed the fundamental drivers for the foundation of the EPSRC Future Manufacturing Hub: MAPP. 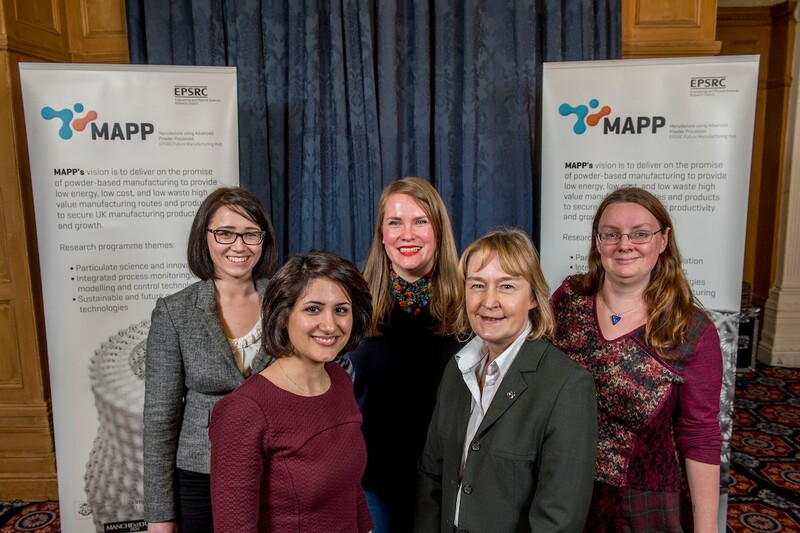 Launched in January of 2017, one year on MAPP hosted its 1st International Conference over two days in Sheffield. The venue was the old yet beautiful Royal Victoria hotel — a building steeped in British history that permeated the corridors, halls and rooms at every turn. Originally named the Victoria Station Hotel when it opened in 1862, to describe its proximity to the primary railway station in Sheffield and to recognise the British Monarch on the throne at the time, it was later renamed the Royal Victoria to coincide with a visit from the Prince and Princess of Wales in 1875. More than twenty years later, Queen Victoria herself was a visitor there just as the first industrial revolution was taking place. Prof. Iain Todd, MAPP Director. MAPP’s central premise is to deliver on the promise of powder-based manufacturing to provide low-energy, low-cost and low-waste high value manufacturing routes and products to secure UK manufacturing productivity and growth. Relatively speaking, it is actually a narrow and specific remit, but one that is absolutely fundamental to progress with a broad reach into a number of connected industries. 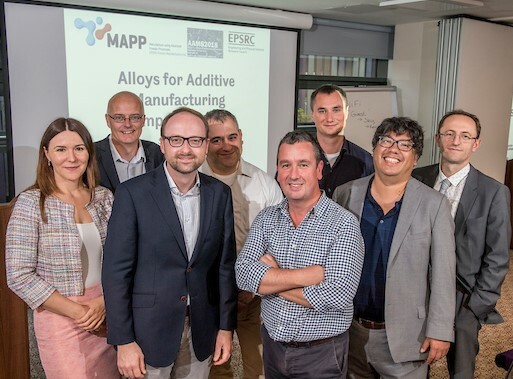 The goal of the first MAPP conference was to draw together scientists, researchers and commercial powder manufacturers from around the world and at every career stage to disseminate the work — and progress — that is being made in this area. Across the AM industry emphasis is often placed on process capabilities, however fundamental to many processes are the powdered materials that are fed into the machines. Off-the-shelf, these materials can prove to be variable in terms of performance and quality, and this is where MAPP is looking to make a difference. 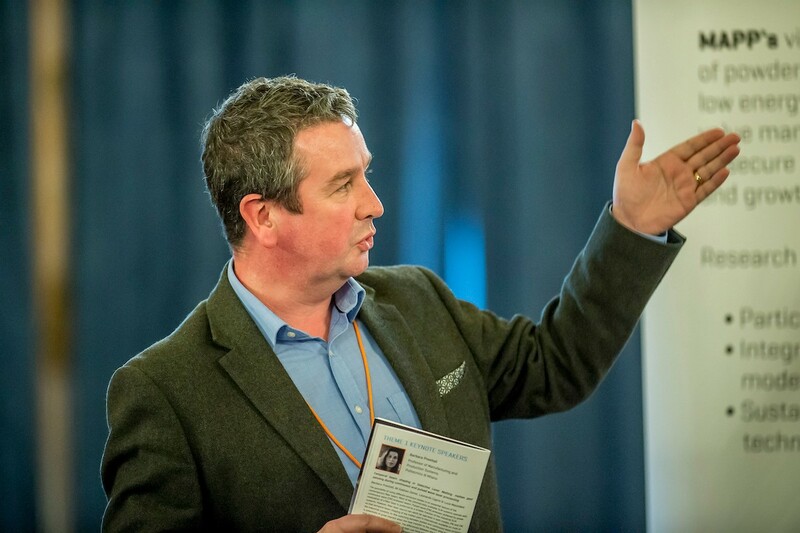 Talking to Professor Iain Todd, one on one, among a variety of topics, he provided a really quite useful analogy for me, one that provided him with a light bulb moment when it happened! He had been talking with a manufacturer of crisps (or potato chips for any US readers). They’d been discussing materials, and this person had described the base material for crisp production as the potatoes. Obviously, you might think, but then consider; if the input is “potatoes” the output always has to be the same 35g ±0.5g! How many potatoes are the same size and shape? Ok, so it’s not a direct analogy, crisp packets do not contain uniform contents, but it serves to illustrate how MAPP is looking to promote powdered materials that are designed for process, monitored in process to ensure an output with designed quality — and to provide the science to back it up. It’s not all new science either, a great deal of it intersects with the food and pharmaceutical industries, Iain said. The Expert Q&A Panel "From Research to Results." A carefully curated mix of in-depth keynote presentations (based on research) together with some faster paced talks and followed by roundtable Q&A’s were blended well to provide delegates with an engaging format. There was also a session dedicated to some “flash presentations” as well as a poster competition detailing the many areas of research being conducted (29 in total) — in a bid to provide insight into the comprehensive scope of the MAPP initiative. The interactive poster session invited delegates to vote for their top three posters during the course of the event. 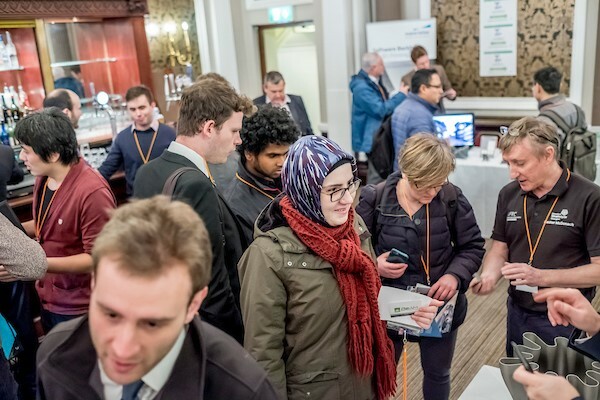 Indeed, networking opportunities were abundant and formally recognised as a key motivating factor for conference attendance. It was also heartening to witness the real diversity across the programme. The key powder material themes driving MAPP research were consistently in view, focused as they are on novel in-situ observation, characterization and modelling and control, to gain a deeper understanding of the interaction between complex processes and materials. Prof. Tresa Pollock from the University of California speaking at the conference. The first in-depth session focused on “In-situ process and performance characterisation” and was keynoted by Professor Tresa Pollock from the University of California. It was hard not to make a mental note that starting with a strong female presenter was a nice touch, however, if it was unintentional — even better. 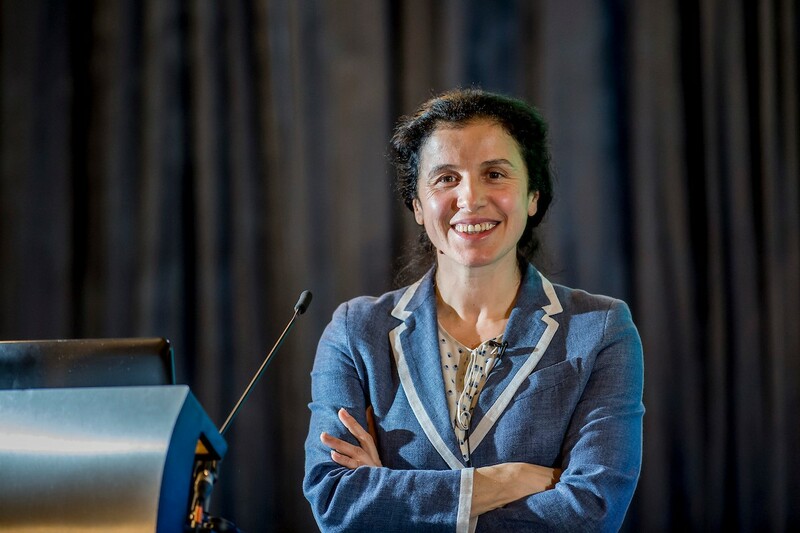 Prof Pollock’s presentation considered the 3D Analysis of structure and defects at the scale of the melt pool, and provided considerable insight into her team’s research using Femtosecond Lasers and Tomography to achieve workable systems for 3D data set collection and analysis during AM builds. As she noted: “In-process monitoring is essential.” In this way, challenges can be identified and overcome, including how “we have to think harder about designing alloys for AM – to minimise residual stresses,” and “develop more amenable alloys, nano functionalisation of high strength alloy powders and design of solidification paths.” This requires large 3D and 4D datasets, but Professor Pollock was optimistic that Femtosecond laser tomography is a promising new approach. 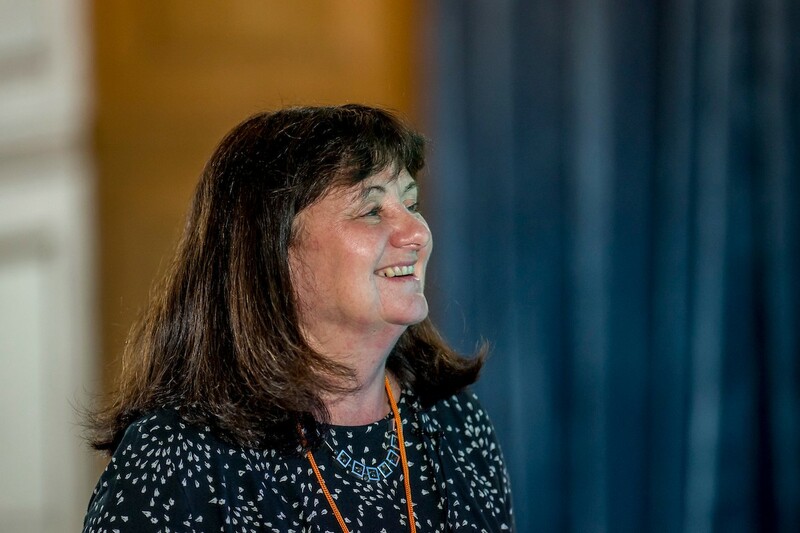 Professor Pollock’s keynote was followed by a second keynote presentation delivered by Prof. Barbara Previtali from the Politecnico di Milano. Another strong female scientist (and role model) working on temporal beam shaping in Selective Laser Melting (SLM) and molten pool sensing during continuous and pulsed wave laser processing. Describing the research approach and the experimental set up (due to commercial SLM platform set up not allowing tests), which includes machine and materials (AlSI); pulse temporal profiles; and high speed imaging (camera synchronised with illumination) for process diagnosis; Professor Previtali was able to show videos of melt pool monitoring in SLM at different build speeds, which were fascinating. The team’s subsequent image analysis identified molten pool attributes and provided a comparison of pulsed wave (PW) and continuous wave (CW) laser processing using differing modes and geometry and concluding that a mixed strategy produces improved results, which in turn will be the focus of future development for higher quality and productivity results with SLM. These very specific, highly detailed presentations were followed by three short, fast-paced presentations and a Q&A session. The highlight of the morning (probably the whole event), from my point of view, was the presentation given by Prof Adam Clare from the University of Nottingham, which considered the issue of ‘finding and fixing defects in metal powder bed processes.’ Apart from the fact that the title of the presentation didn’t require a definition search, and that the science was no more or less impressive than any of the other fields of research, Professor Clare’s insight and delivery were wholly accessible to a layman like me. Plus, he has a wicked sense of humour — that always helps. 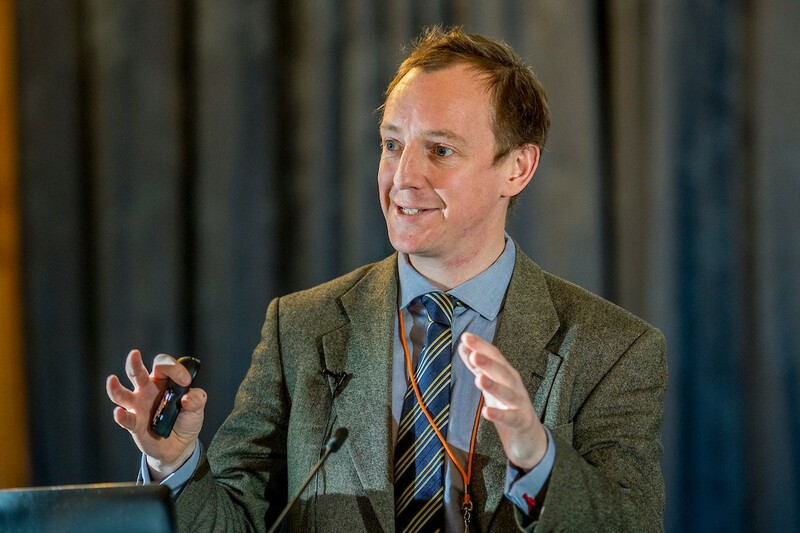 Prof Adam Clare from the University of Nottingham speaking at the conference. • Online correction – intelligent machines (the panacea) correcting on the fly. And while Adam identified some commercial analysis tools that are starting to emerge from vendors, he delved into the research he is conducting at Nottingham, which takes a different approach – spatially resolved acoustic spectroscopy — the goal of which is to develop an “information rich production machine” supported by in-process monitoring (online), which requires a specific instrument in the machine. There are many logistical challenges here, including the optical measurement of rough surfaces; fitting the tool inside the build chamber and the necessity to miniaturise the optical train and use of galvanometer; as well as the impact on build time. Moreover, beyond monitoring the research is considering how to produce real time feedback and correction/action by developing algorithms for controlling microstructure repair. This information was delivered so well, it actually lifted the room, the potential excited people — even more so considering what it enables: the ability to effect rework in-process, which will drastically enhance the economics of AM. Prof Peter Lee, University of Manchester, at the conference. 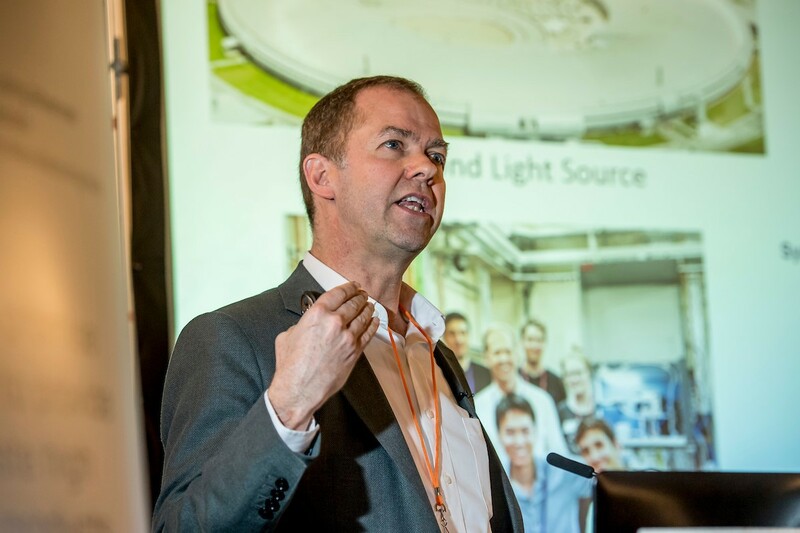 In a similar vein, Andrew Moore of Heriot-Watt University and Peter Lee of the University of Manchester also provided research insights into the “High speed imaging of the powder bed and shield gas during metal PBF additive manufacture” and “Shining new light on the mechanisms controlling laser additive manufacturing using synchrotron imaging” respectively. Again, there were some fascinating videos, courtesy of high speed imaging (8000 frames per second) and Schlieren imaging techniques that provided real time footage from within the chamber showing laser meltpool spatter etc, at different angles and speeds. It was incredible imagery that offers real learning material. Some of the videos are available online. Other presentations across the event drilled down into projects funded through MAPP. Notable among these the work being undertaken at the Harwell campus and research complex (home of the diamond light source) to develop and build new equipment using synchrotron hard X-rays to see inside the build – not just the surface of it, to track what happens layer by layer and then build up a valuable data set including a process map and a mechanistic map. Beyond the process, however, and in line with the MAPP remit, the research here also investigates powder quality and new material development including comparing virgin powder against oxidised powder to understanding how much oxidisation can be tolerated without impacting quality. It was interesting to learn that “powder flows better when slightly oxidised” but the team is looking to discover how AM can be used with a laser to directly process ceramics and correlate results with other methods (Optical and IR / X-ray etc) as well as develop machine learning algorithms based on what is happening in the meltpool. Another key theme of MAPP research with a dedicated session at the conference is that of Advanced Characterisation. This is a fascinating area of research, and at this conference, it was all about the what, why, where, who and how material characterization was progressing for AM. These details are not pre-requisite for the vast majority of the AM industry, but I know that the results are, and they will have a massive impact on future industrial capabilities of the technology in the real world. That’s a key take-away here. Indeed the MAPP conference provided repeated examples of why such conduits between academic research and industry are vital. As you might expect, the characterisation of material powders is a complex and multi-disciplined field that involves understanding — and utilizing — their physical structure and chemical composition to understand and measure their properties, including but not limited to stiffness, strength, ductility, hardness, electrical/thermal conductivity etc, in relation to how they can be processed, react in-process and ultimately, finished part quality and integrity. Prof. Jin Ooi from the University of Edinburgh at the conference. 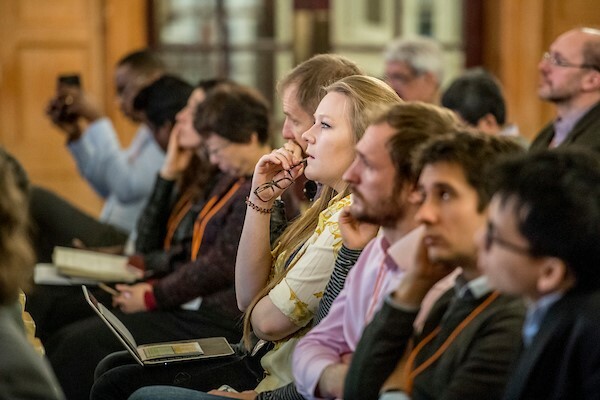 The two days were concluded with a final session comprising an expert panel talking about getting “from research to results: Is powder research responding to industry needs?” And chaired, expertly by Sophie Jones, General Manager of Added Scientific. I think my biggest take-away that I can share is that this event provided an opportunity to better understand the advanced techniques that are taking place deep inside the PBF additive manufacturing platforms. Powders demand a different approach to other material states and this is the remit of MAPP — to find the best ways to make powders work for industrial applications. Delegates and sponsors networking at the conference. The conference, as often is the case, included an evening dinner reception — these things serve multiple purposes. The obvious one of necessary refuelling after brain overload is superseded by the opportunity to network with other attendees. On this occasion, my dinner companions for the evening were most lovely – Iain Todd, Hugh Hamilton (Johnson Matthey), Kelly Moran (AMRC / Rolls-Royce) Dan Johns (Oerlikon), and Javier Llorca (IMDEA Madrid). Conversations were free flowing and varied and often reverted back to families and commonality — a vital under-pinning of human interaction. Of course, there was a great deal of chatting about the MAPP commonality (the reason we were all sat at the same table) its intent, where it fits in the UK AM community/global ecosystem, academic community and more. The breadth of experience, global locations and motivations and how we interacted were a perfect analogy for the current status of AM, I mused. To sum up, it was a really interesting and useful event to attend — not too big, lots of extremely intelligent people, with passion in abundance soaking up the science behind some fundamental AM developments — disseminating, reporting, sharing and learning. How it should be.